Offensive patience in the second half earned a championship for the FlameThrowers. San Francisco’s Joel Schlachet lays out against Toronto’s Bretton Tan. Photo: Gaetan Dussault — AUDL. MONTREAL — The Toronto Rush dominated points at the end of quarters in their game against the Dallas Roughnecks and in the first half against San Francisco in the Championship. But costly errors at the end of the third quarter and great play by the FlameThrowers at the end of the fourth quarter sealed the victory for San Francisco, who claimed their first AUDL Championship with a 30-29 victory. Much like on Saturday night, the Rush struggled in the opening points. Thomson McKnight opened the game by throwing into a poach which led to a San Francisco break. Trailing 2-1, the Rush got broken again after turning the disc multiple times in one point. The players from Toronto’s D-line ended up getting the first two holds for the Rush in the opening quarter. The offense just couldn’t find its footing. But if there were questions about whether Toronto would have enough mental energy after a big victory Saturday night, they were quickly put to rest. The offense settled down. Andrew Carroll was getting isolated off pull plays and making life difficult on whichever San Francisco defender was tasked with guarding him. Trailing 5-4 in the first, a Grant Lindsley throwaway gave the Toronto defense the disc for the third time. This time, the Rush converted as Jaret Meron completed a big huck to Mike Mackenzie to tie the game. As soon as Toronto got the break, though, San Francisco went on a run. A vintage Ashlin Joye-Beau Kittredge connection — one that we saw multiple times in the game — got the FlameThrowers a hold. A couple miscues gave the San Francisco defense short fields and quick breaks. The FlameThrowers led 8-5 when they pulled near the end of the first quarter. In an effort to soak up some clock, the FlameThrowers threw zone to slow down the Rush. But as they did in the semifinals, the Rush played it perfectly. Ben Burelle perfectly read a Thomson McKnight shot to the end zone, catching the disc easily outside the pile as time expired. Both offenses stepped it up in the second quarter. After Mac Taylor found Jordan Marcy in the end zone, the FlameThrowers led 14-11. At that point, the Rush offense hadn’t turned the disc in the second quarter, the FlameThrowers had only turned it once, and neither team had been broken. After another Toronto hold, San Francisco suffered a couple unforced errors. Joel Schlachet threw the disc away, Toronto called a timeout, and the Rush offense punched in the break. The very next point, Joye had an uncharacteristic huck that no San Francisco player appeared to be cutting for. Once again, Toronto called a timeout to bring in the offense. Once again, it worked after a nice play from Carroll. With little time left in the first half, the FlameThrowers got the disc after the Rush offense turned it for the first time in the second quarter. San Francisco subbed in its offense. But Bretton Tan provided tremendous pressure on Joel Schlachet, leading to a FlameThrowers turnover. With two seconds left on the clock, Geoff Powell caught a scoober from Mark Lloyd for the crucial hold. Toronto had nailed the end of quarter point once again. In their game against Madison on Saturday, the FlameThrowers were tied 8-8 at halftime. On Sunday, they found themselves tied with the Rush, this time at 16-16. The third quarter initially quelled any Toronto momentum. San Francisco had broken Toronto twice to take a 20-19 lead. With San Francisco receiving, Grant Lindsley went to work, making a nice grab on an under cut that initially looked out of reach. He followed it up by catching the score from Cassidy Rasmussen, leaving his defender Jacky Hau trailing behind him. Toronto wasn’t done, though. Carroll came down for a score on a huck from Cam Harris, and Mackenzie got a much needed block as part of a double team on Grant Lindsley. The very next point, Lindsley was flustered once again, getting stalled out by a double team. Both times, Mark Lloyd threw the assist for the break, taking care of the disc for the Toronto defense. San Francisco answered right back, with Lucas Dallmann coming through for a clutch block in the end zone on a pass from Burelle in the end zone. The FlameThrowers worked the disc down the field and Dallmann found Byron Liu to convert the break. The closing point of the third quarter would be a vital one for Toronto. Trailing by one and with San Francisco set to receive to start the fourth quarter, the Rush badly needed a hold. After a couple turnovers from the Rush offense and a FlameThrowers timeout, a miscommunication between Eli Kerns and Ashlin Joye gave the Rush a prime opportunity to get the hold. But there were only 11 seconds left in the quarter. Lloyd had thrived in these situations before, but this time he couldn’t find a good option. A floaty throw would get blocked in a pile of players. San Francisco led 23-22 entering the fourth quarter and would never relinquish the lead. Trailing 25-23, Adrian Yearwood led Burelle a little too far, leading to a turnover and a Burelle injury. Joye came into the game and helped the FlameThrowers convert the first break of the quarter. While Toronto trailed, there was still plenty of time on the clock. With 5:51 remaining, the FlameThrowers received the disc, leading 27-25. Great handler defense from Geoff Powell opened up an opportunity for Mark Lloyd to swoop in and get a fantastic poach D. Lloyd quickly fired the disc to the end zone, perfectly leading Powell for the transition score. Toronto had some late life. It looked like the game might head to overtime after a San Francisco turn gave the Rush the disc with a chance to tie the game at 28. But Eli Kerns smacked down a Powell huck. Kerns sent the disc deep to Mac Taylor and it initially looked like it was too far. Taylor laid out and grabbed the trailing edge of the disc for a critical score to preserve the two point lead. With 3:12 left, San Francisco received the disc, leading 29-28. In a show of remarkable poise, they possessed the disc for nearly two minutes. San Francisco worked the disc forward, backward, side to side, and forward again. With just 1:21 on the clock, Cassidy Rasmussen threw the score to Marcelo Sanchez. Toronto got the must-score hold and pulled with 38 seconds remaining. The Rush pinned San Francisco in its own end zone but couldn’t come up with a block. The FlameThrowers were able to run out the clock to secure the 30-29 victory. This marks the first AUDL championship for San Francisco, though it was the fourth in a row for Beau Kittredge. While some of the other players on the team had won it before playing with the San Jose Spiders, many had not won on this kind of stage before. And despite the FlameThrowers being the team to walk away with the title, in many ways it felt like Toronto had the best weekend. The Rush took out the defending champions and played another great game against San Francisco. While many were dismissive of their chances, their young players stepped up in a way they didn’t last year and brought the team to another level. 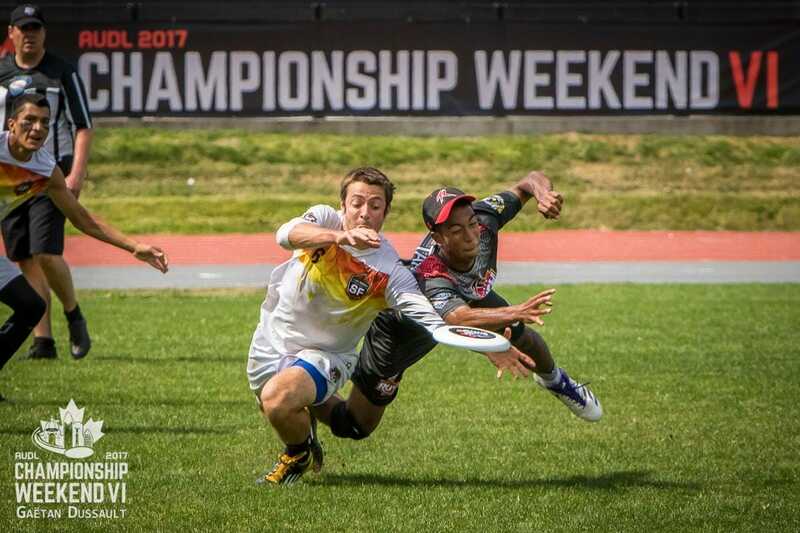 Comments on "San Francisco Wins First AUDL Title In Nailbiter"